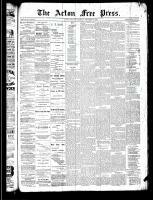 appeared in Acton Free Press, 26 Dec 1889, p. 3 ERIN. appeared in Acton Free Press, 26 Dec 1889, p. 3 OAKVILLE. appeared in Acton Free Press, 26 Dec 1889, p. 3 Sudden Deaths at Mt. Forest. appeared in Acton Free Press, 19 Dec 1889, p. 3 Death of an Esteemed Early Settler. 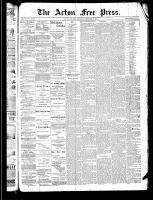 appeared in Acton Free Press, 19 Dec 1889, p. 3 Drowned at Guelph. appeared in Acton Free Press, 19 Dec 1889, p. 2 DEATH OF REV. DR. WILLIAMS.